I don’t usually write about cocktails. I don’t usually drink cocktails. But this Cinco we had quite a spectacular Drinko that felt worthy of a post. And posting makes it easy to find the recipe again. Not that I am going to start drinking cocktails. But I might drink this one. The Drinko came about because I was hosting a dinner for The Julia Child Foundation and it happened to fall on Cinco de Mayo. So when life gives you lemons, you must make lemonade, or perhaps margaritas. Baby Girl had just returned from college and she brought a friend so I quickly got them on board as my kitchen help. I asked one of my culinary and party genius girlfriends to help me host and she graciously agreed. We organized a planning meeting (which is code for cocktails) to decide on the menu. At the “planning meeting” Baby Girl saw something on the “menu” that struck her fancy….Watermelon Pineapple Margarita. She ordered and it arrived looking like a beautiful pinky-red martini. The planning committee all tried it and our first decision was unanimous. That was to be our drink for the Cinco de Mayo party. It was citrusy but not too tart, with just the slightest tinge of sweetness, nice watermelon undertones and cutting through it all was lovely smooth tequila. Rest assured, we also made decisions about food for the party menu and you will read about some of it here one day, but our planning was decidedly cocktail-focused once the margarita martini showed up. We left the “meeting room” (bar) planning to meet two days later to concoct the cocktail for our party. But as luck would have it, my friend (yes, it was MaryAnne) “happened” to be back at the same location the next night for another “planning meeting.” She procured a recipe for our Watermelon Pineapple Margarita Martini. Ingredients were written on a napkin with no instructions. I didn’t ask how she got it. It was at first taste on the night of the party that Baby Girl spontaneously renamed it Cinco de Drinko, apparently a common term with college kids but unknown to us old folks. We loved the name. We loved the drink. It was toasted many times during the night and our guests happily dranko all the Cinco Drinkos. Thank you Baby Girl and lovely college friend. Thank you meeting place bar staff. Thank you MaryAnne for being our chief of recipe procurement. 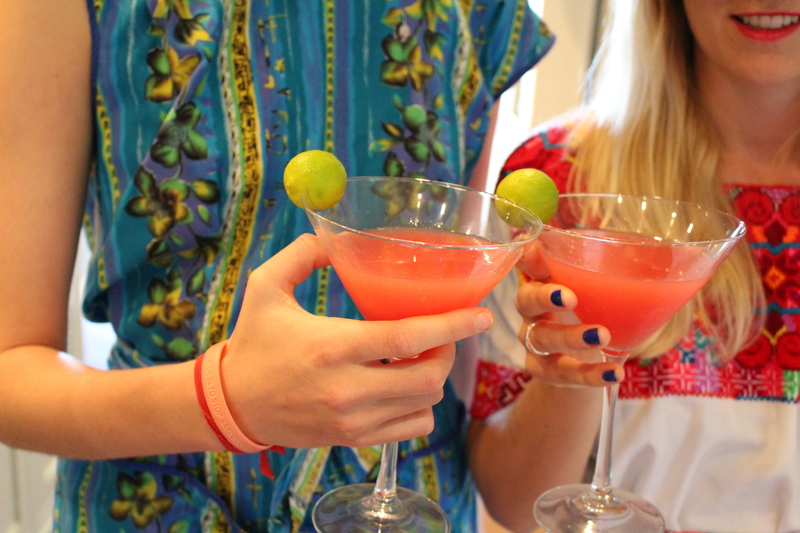 Cheers to the Cinco de Drinko! Pour tequila into a large, wide pitcher. Peel, core and slice the fresh pineapple into large wedges, add to the pitcher and refrigerate. Peel and chop watermelon into large chunks. Puree in a blender and refrigerate. Pour 1 cup fresh lemon juice into a pitcher. In a saucepan, stir together 1 cup of water and 1/2 cup of sugar. Bring to a simmer and stir to dissolve sugar. Simmer for 3 minutes. Remove from heat and cool. Pour 1 cup sugar water (simple syrup) into the pitcher with the lemon juice and refrigerate. Strain tequila back into the bottle, setting aside the infused pineapple for another day, or for garnish, or for the kitchen staff. Mix 2 cups pineapple-infused tequila with 1.5 cups watermelon juice and 1 cup lemon juice in large pitcher. Using a shaker filled with ice, pour drinks into shaker and shake to chill. Pour into martini glasses and garnish with fresh lime. Pour two ounces tequila, 1.5 ounces watermelon juice and 1 ounce sweet lemon juice into a shaker and shake to chill. Pour into a glass and serve. LOVE this post. Makes me want to have a Cinco de Junio party. Virginia Willis says we should Lighten Up so let’s have Peach Soup!